A Curacao based company known as the Jubise International N.V Casinos is the operator and owner of the Golden Star Casino. Founded in 2012, the Casino is licensed by the Curacao Gaming Authority. With the license, Jubise is able to attract the software vendors and the payment processors it needs so that it can offer you a great gaming experience in the Casino. With titles from various online game providers, the Golden Star Casino normally features hundreds of games and contains bonuses and promotions that keep its client always entertained. Additionally, the Casino maintains a high-end security protocol, an astounding customer support, and Is certified for fair play by iTECH labs. The several providers allow the Golden Star Casino to offer you with a high range of looks to their slots catalog. They range from the 3D slot games to the fabulous content of the Microgaming slots. Some of the titles that are found in the slots lobby include; 108 Heroes, 12 Zodiacs, 2016 Gladiators, among others. The Golden star table games options are a bit underwhelming considering the number of suppliers the firm has partnered with. However, the Casino has a good number of table games for the players. The table games section has about twenty-eight games. Some of the games include varieties of poker, baccarat, roulette, and blackjack. Specialty games are one area that the Casino has really spent time towards their development. By using their longtime partners, Golden star Casino provides a variety of games to play. Some of the specialty games found in their lobby include; Heads and Tails, Scratch Dice, Bunner Boilers and many more. Ezugi has been selected by Golden star to their only Live dealer provider. From the perspective of the game, there isn’t much in terms of selection from the Ezugi although their dealers and studios used by them are quite nice. Through the live dealer function, you can comfortably play Bet on numbers, Keno, Blackjack, and Roulette. This bonus is equal to 100% of the very first deposit but it is not greater than 1000 NOK/SEK, 100 EUR/USD, 150AUD/CAD, 700 RUB plus the free spins winnings. 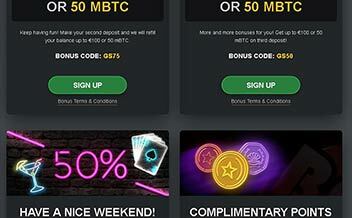 For this bonus type, a minimum of 30 AUD/CAD, 20 EUR/USD,100 RUB, 200NOK/SEK is required. The wagering requirement is 50x the total sum of the received bonus and free spins winnings. This translates to 75% of the amount of the second deposit that is made but not greater than 100 EUR/USD. So that you can get this bonus type, you must deposit at least 20 EUR/USD. Wagering requirement: is 50x the total received a bonus. This translates to 50% of the deposit amount made but not greater than 100 EUR/USD. To qualify for this bonus type, you are supposed to make a deposit of at least 20 EUR/USD. The wagering requirement is 50x the 3rd deposit bonus received. Receive a bonus of 50% of the deposited amount made but not greater than 100 EUR/USD. This deposit is only availed once in a week from Friday to Sunday. To get this type of bonus, you have to deposit at least 20 EUR/USD. The wagering requirement is 50x the 3rd deposit bonus received. 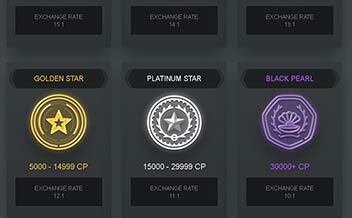 The bonus type applies to players who have achieved Black Pearl status, Platinum star, and Golden star. The bonus is given to clients who have balances that are negative for the last week. 3X the bonus received is the wagering requirement. The Golden Star Casino has an amazing software that brings together some of the industry’s greatest developers. 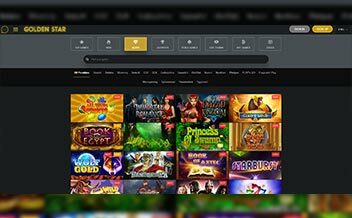 The providers of the games include NetEnt, Pragmatic play, iSoftbet, Endorphina, GameArt, Ezugi, BetSoft Gaming, Amatic, and SoftSwiss. The number of currencies supported by the Golden Star Casino includes bitcoins (BTC), Norwegian Krone (NOK), Swedish Krona (SEK), Australian dollar (AUD), Canadian dollar (CAD), Russian ruble (RUB), US dollar (USD) and euro (EUR). The Casino has restricted the following countries; the United Kingdom, Spain and United States. When in those restricted countries, you can only play the games through the option of play for fun. English, German, Greek, Turkish, Spanish, Finnish, Swedish, Norwegian, Russian. Golden Star Casino can be considered as secure enough in terms of security. The sensitive data of players’ is protected by the SSL encryption. 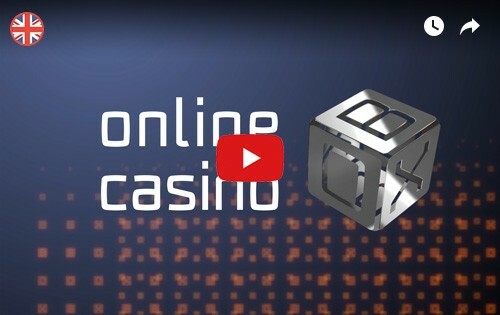 The games on the Casino have also been well audited by the iTechLabs. For any clarification, complaints or question, the player is advised to visit the support page and ensure that he uses the contact form available there to send email to the admin or support team of the Golden star. Before the player sends any queries it is advisable for the player to visit the FAQs because their questions may already be answered in that section. There is no support for phone numbers but support is available through email address sent to the support team. The Golden Star Casino has been operating for close to eight years now and in that period that it has been operating it has offered its players with one of the best Casino experience by offering a variety of interesting games to keep the players enjoying the games. Additionally, their bonuses packages and promotions offered by the company attracts a lot of clients for their business. 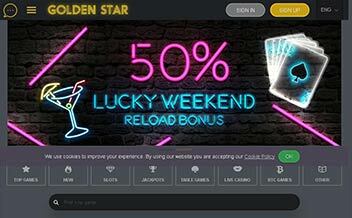 Online players should know that Golden star is the place to catch the best online games.